Beer Bottle Pint Glass – D-I-Why Not from www.KORDUROY.tv on Vimeo. I may have to try this myself at some point. I’ll post the results if I do. 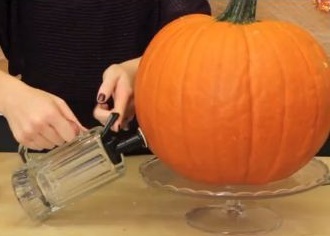 Looking to make use of the pumpkin this holiday season for something other than a jack-o-lantern? 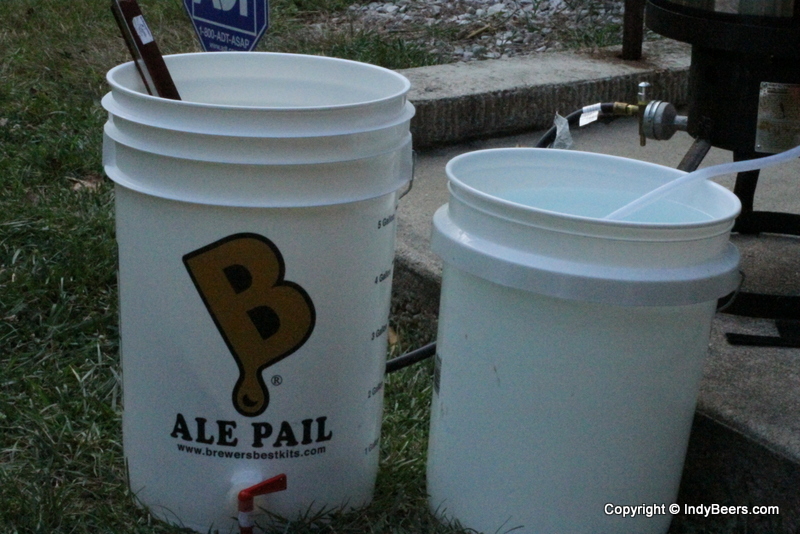 Why not use it as a keg for your favorite seasonal beer? 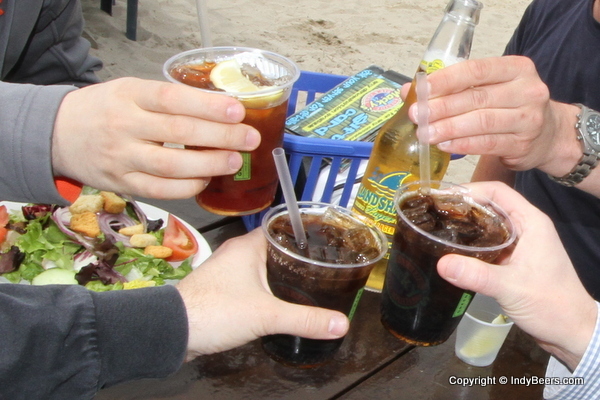 Ever been out drinking and needing to say cheers to the foreigner at the bar? How about traveling abroad and meeting new people in new places and being in need of saying cheers to toast the new fun? Now you can. The fine people over at matadornetwork.com have put together a great guide on how to say cheers in 50 languages. 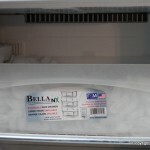 Previously I posted a link about chilling my wort using ice in the article Going Green with Your Wort Chilling Process. 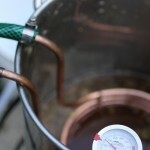 Based on some feedback I received I wrote the follow-up article The Greenest Wort Chilling Process I Found. That second process works fine, but I prefer to pitch my yeast right away instead of having to wait several hours. Going back to the comments from reddit regarding the first post there was another option for chilling wort that I still wanted to explore. 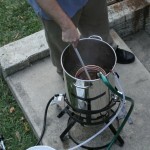 It was stated that the wort could be chilled by simply running the water from the garden hose through the wort chiller. 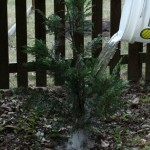 I thought this would be a waste of a lot of water, but some others stated it wouldn’t. More like 15, in my case. 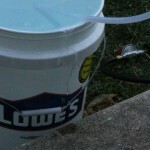 And I save the water in a bucket and my 10 gallon cooler to wash things out. 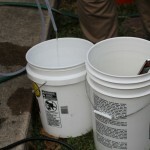 5 gallons (the hottest runnings) goes into a bucket with PBW for washing gear, 10 gallons goes towards rinsing out the MLT. I open the faucet very little and run it for maybe 20 minutes. Any longer than that and it’s diminishing returns. Any faster than that and water streams out of the connectors. Also, I stir the wort frequently. This is probably the best way to make the process “green”. I just run my wort chiller from the faucet in my basement, straight into the washer. 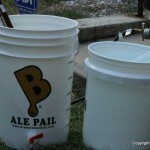 I can cool a 5 gallon batch down to 70F with almost exactly the amount of water it takes to do 1 large load of laundry. If I don’t have any laundry to do or just have half a load, I use the remaining lukewarm water to wash my equipment. I didn’t blast the water, I ran it pretty slowly to avoid overflowing the washer. I also stirred vigorously every few minutes. 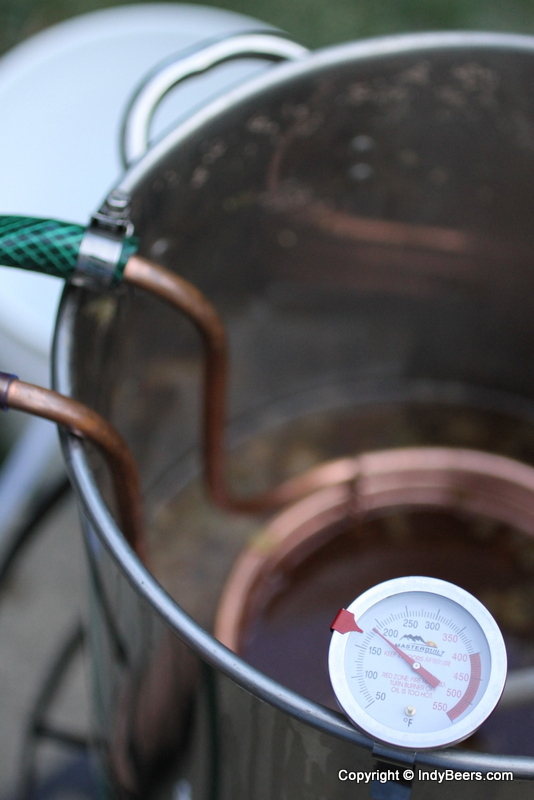 My object is to have the water flow just hard enough to fill the tubing/chiller completely so you get maximum surface area for cooling, while running it as slowly as possible so it has the maximum amount of contact time with the wort. 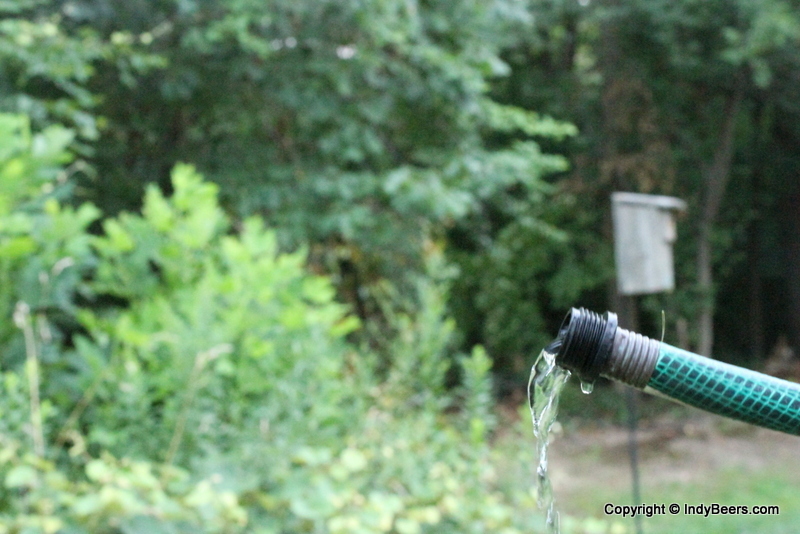 It does slow down my process, but it’s worth it to me to not waste the water. 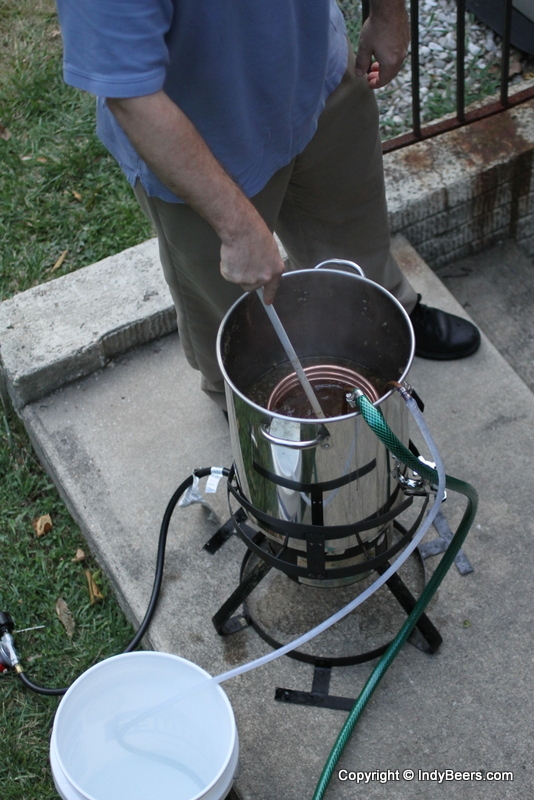 I also stir vigorously and often, and “precool” my wort chiller by immersing it in a cold tap water bath, which I later use to clean my chiller/other equipment. 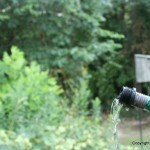 Most people seem to run their faucet at a low pressure. In my case, my copper tubing is pretty narrow but 50′ long. That gives a fair amount of surface area to chill and only a bit of water needs to flow to carry out the heat. Stirring and moving the chiller around also makes a big difference. You can feel the outgoing water get a lot warmer as soon as you start moving the chiller around. I usually chill 5 gallons in about 10 minutes, maybe less. It was time to test the low flow water theory and see how well it worked. 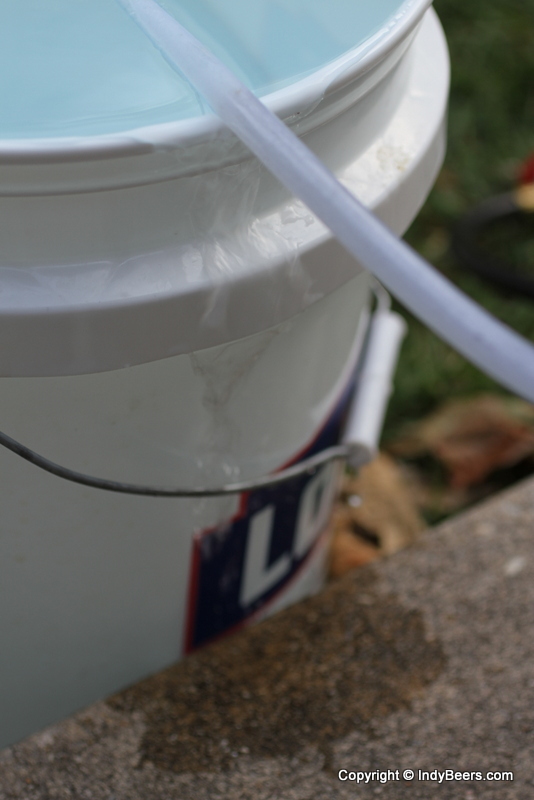 Last week when I brewed beer my brother and I used the low flow water method and we were able to cool 2.5 gallons of wort in 35 minutes using 10 gallons of water. Here are the pictures for the test. 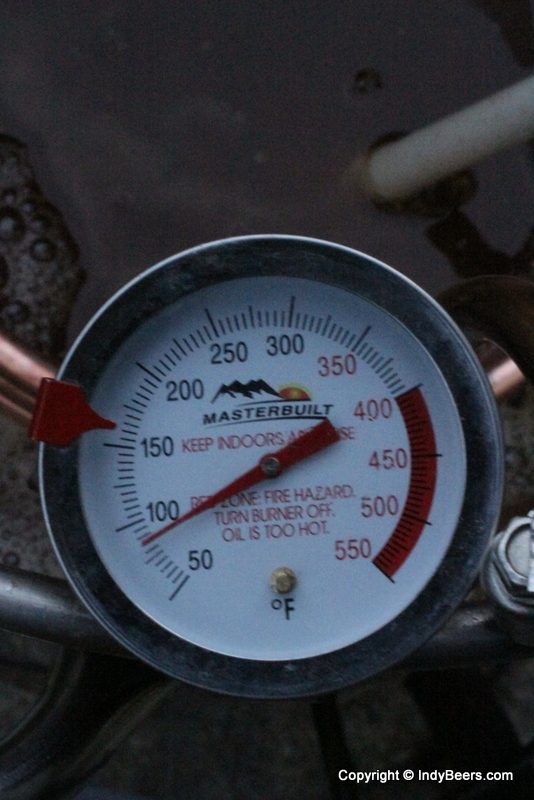 Starting the process of chilling the wort at 7:29pm. The temperature was falling at a steady pace. 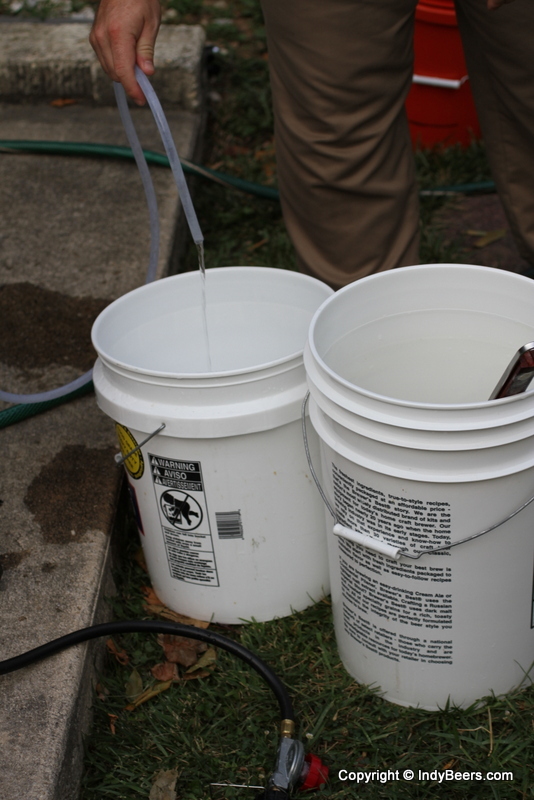 We were letting the excess water go into the 5 gallon bucket on the right to measure it and for later use. 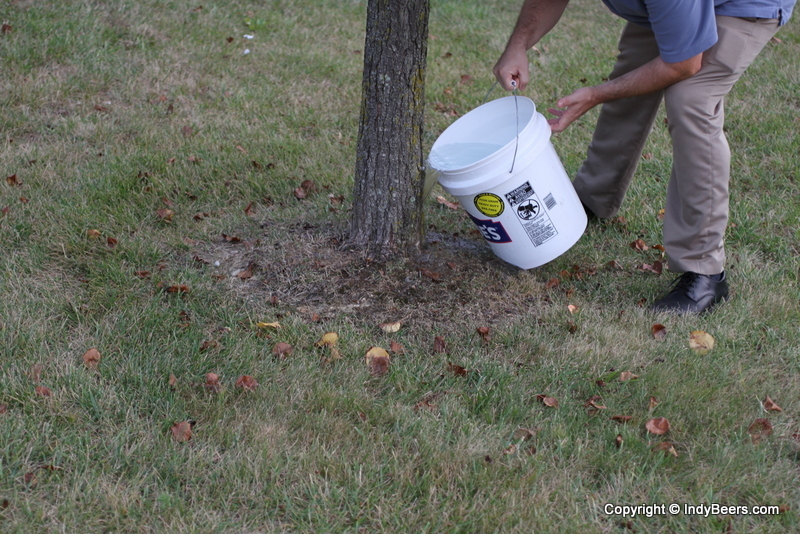 Once the bucket was filled, we stopped the flow of water while we emptied the bucket. 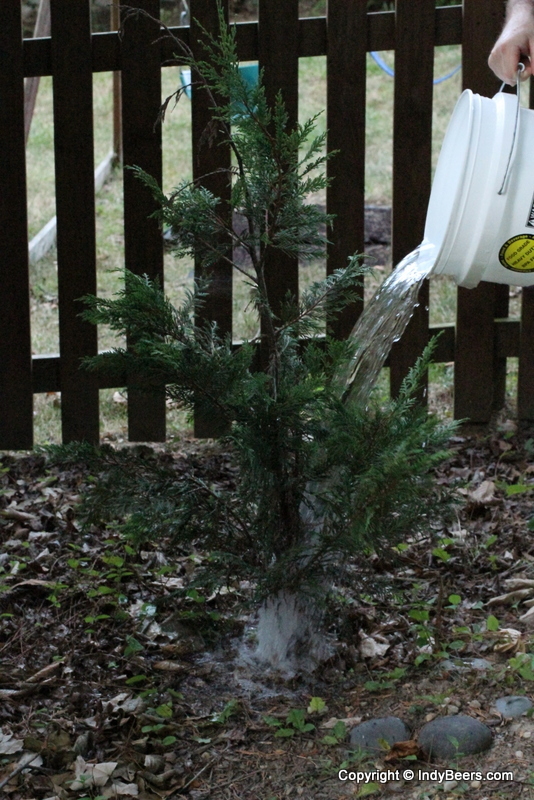 There are a few trees and plants in my yard that don’t get much water, so we used the water on them. 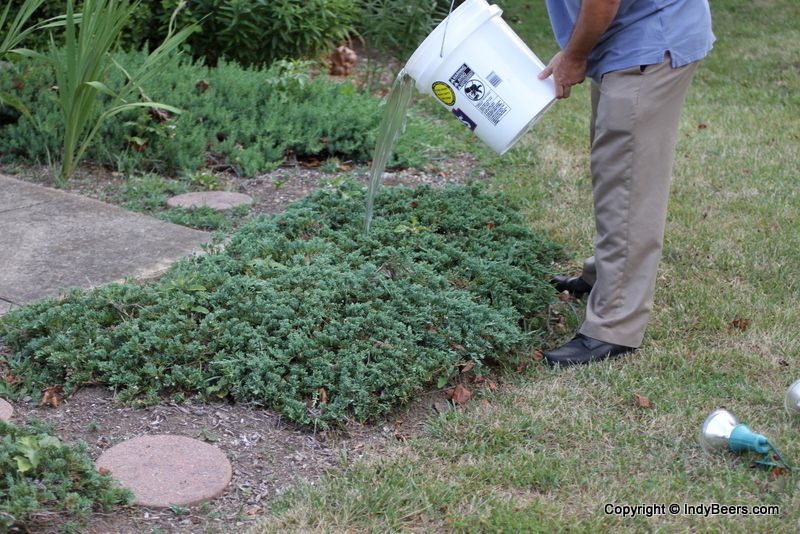 Even in times of a drought with water restrictions, hand watering plants with a watering can is permitted. 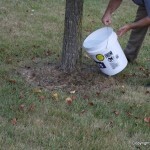 With the watering done (which only took about 60 seconds), we restarted the flow of water and began filling the bucket again. 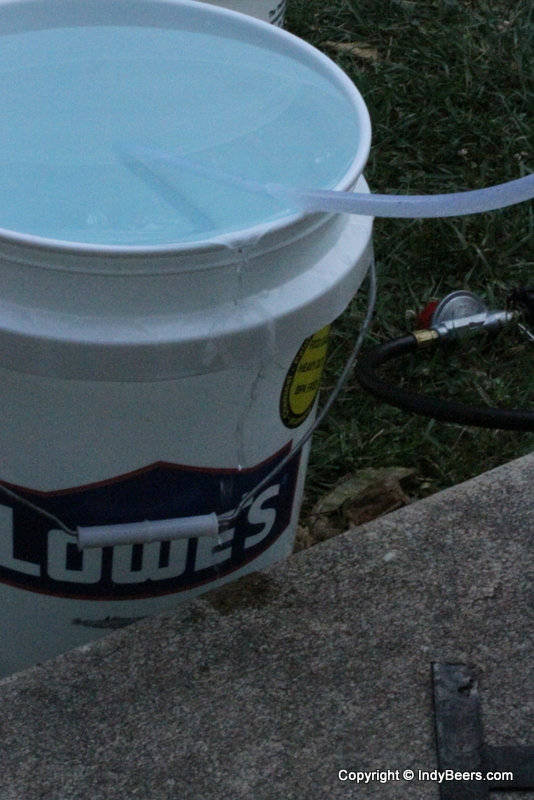 At 8:04pm (35 minutes later) the second bucket was filled for a total of 10 gallons used. 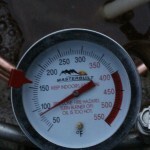 The temperature was now at a satisfactory level as we still had to add 2.5 gallons of filtered tap water. This was the flow of the water. You can see it was just a trickle. 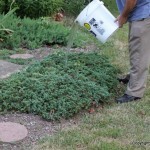 I then used the second batch of 5 gallons to water some more plants. 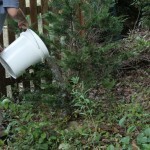 These leyland cypress have really been struggling in the heat, so the water was really good for them. 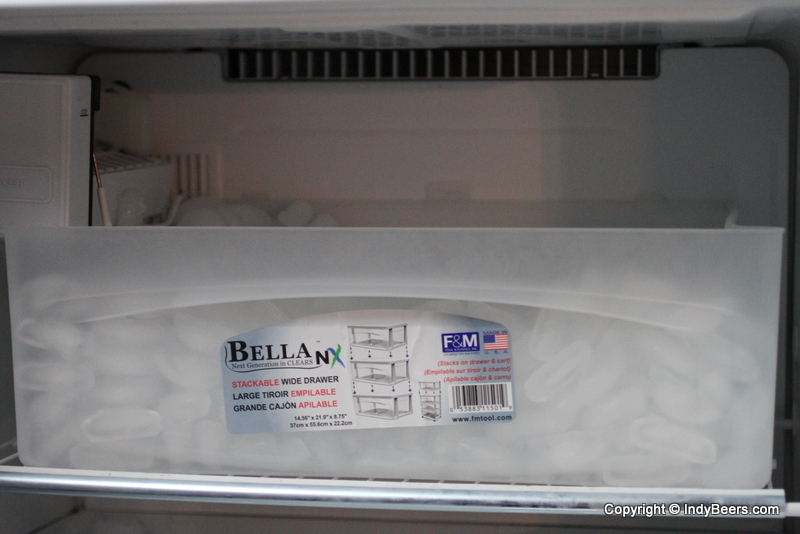 This was the ice I used to use when I circulated the water through an ice bath. The dimensions on the sticker equate to 2,790 cubic inches which is about 12 gallons. Keep in mind I floated the ice in water. So the low flow method seems to use less water. I was thinking about what I was going to brew this week when it dawned on me, I can’t brew beer this week. Not because I don’t have time. Not because I couldn’t go to the store and buy supplies. I can’t brew beer this week because I have no where to put it. You see, I have gone a little nutty with the beer brewing. 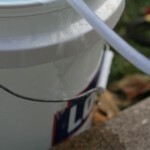 I decided to see what would happen if I brewed 5 gallons beer every.single.week. 5 gallons of beer is about 2 cases and a 6 pack of beer, but you drop some volume during brewing, so we’ll just say 2 cases. That’s a lot of beer. I can do a keg a week (with a little from my friends), but it’s not the norm. 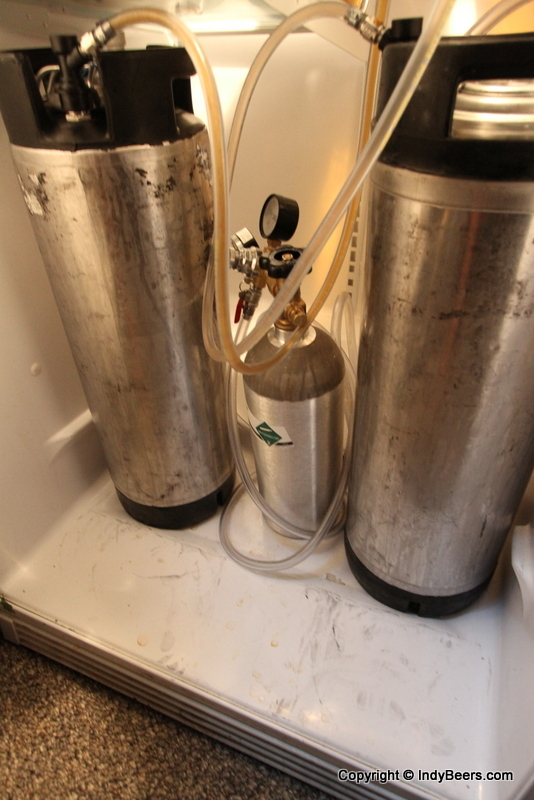 Currently I have 2 kegs of beer in the fridge, and 4 buckets (5 gallon each) fermenting. I have no more kegs, I have no more buckets, I have no room for more beer. 6 weeks straight of brewing have finally brought me to a place of rest. With Spring coming soon it’s time to start your list of Spring projects to do. Here are a few DIY beer related items that you might want to consider in the coming months. The first thing you’ll need is a beer mug, so why not make your own. You’ll need someplace to drink that beer, so why not build yourself a bar. You’ll need some beer to go with the mug and bar, so why not brew your own. 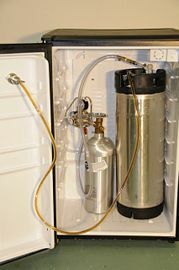 When the beer is done you’ll need a place to store it, so it’s time to build a kegerator. Of course, maybe you’re looking for a non-conventional beer dispensing method, like a fire extinguisher. If you’re into bottling instead, you’ll need to make some labels. Or maybe you want more than just a label, how about a whole 4-6 pack setup? If you’re like me, you have kids around a lot, so you should have some beer for them, too. You could also have fun treats for the adults. And lastly, while everyone is hanging out enjoying everything you’ve made they will surely be using your Wi-Fi. Time to build a Wi-Fi booster.